Need a wake-up call? How about room service? Want to know how to get to the pool? For guests staying in a number of San Francisco and Chicago hotels, those services and more are available right at their fingertips thanks to Canadian-developed tablet technology. 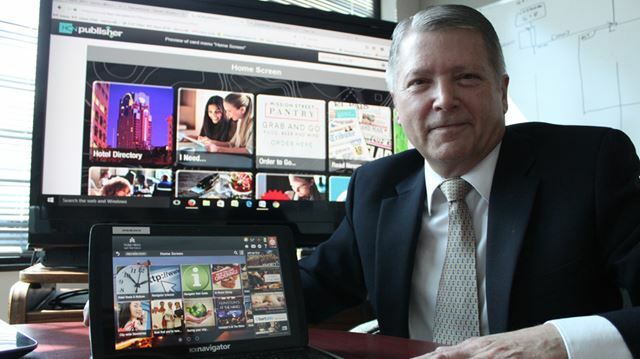 An Ottawa company has become an instrumental innovator for some of America’s largest hotels by developing and providing in-room tablets, giving guests access to a full array of services. “It literally changes the way they (hotels) do business,” said Barry Brisco, chief operating officer and a founding partner of the Hotel Communication Network, located on 2460 Lancaster Rd. near the Canada Science and Technology Museum. The success of the company, which launched in 2009, can, in part, be credited to a $525,000 loan it has been receiving from the Federal Economic Development Agency for Southern Ontario or FedDev Ontario. The funds, which began rolling out in April 2014, have aided in the creation of 20 full-time jobs, have helped maintain 16 jobs, and have allowed the company to raise more capital to the tune of more than $4 million from other Canadian investors since 2014. “That comes from the success of this project and the confidence that comes from government support,” said Brisco. Providing companies with financial assistance also allows them to better access global markets, said Ottawa South MP David McGuinty, who announced the funding on May 5 on behalf of Navdeep Bains, minister of Innovation, Science and Economic Development and minister responsible for FedDev Ontario. Bains previously said he wants Canada to become “a nation of innovation,” McGuinty said. The dollars have allowed the company to hire enough staff to grow its hotel tablet network project. “It brought us to the point where we have world-class hotels, some of the biggest hotels in the world coming to us asking us to install (in) their properties,” Brisco said. The company’s tablets are now installed in a number of large hotels, including the 1,650-room Palmer House Hilton in Chicago, the 1,900-room Hilton San Francisco Union Square Hotel and the 1,500-room San Francisco Marriott Marquis. Another 6,000 tablets are in transit and will soon be installed in more hotels. “We will literally double our install base in the next three months and we’ll double again in the next six months,” said Brisco. While there are two or three other companies in the world that also offer hotel tablet technology, the Hotel Communication Network has the advantage because it provides around-the-clock maintenance, said Brisco, adding company employees work on site in client hotels and Ottawa staff have the ability to serve and update the devices remotely. Each hotel room equipped with the tablets means guests have everything at their fingertips. The advantage for hotels is they don’t have to spend money publishing print materials for each room. The tablets also provide up-to-the-minute information on a wide array of services within the hotel and in the city, and the tablets can be updated to reflect new specials and promotions. Guests can also access the Internet via the tablets. “It’s an entirely new level of communications and service between the hotel and its guests,” Brisco said. Some hotels offer its service menu through smartphone apps, but Brisco said these are only reaching 10 to 15 per cent of guests. That means hotels must still rely on printed materials and other traditional ways of doing business, which results in an additional cost, said Brisco. One of the Ottawa company’s tablet apps allows guests to order food from about a dozen area restaurants. A bike courier is then dispatched to pick up the food order and deliver it in about 25 minutes. “They’re discontinuing room service in major full service hotels. Too expensive. They lose money,” Brisco said. And because the tablets are installed in each room and provide a single menu of all available amenities offered by the hotel and businesses in the city, about 80 per cent of hotel guests are using the technology. That frees up hotels to concentrate their efforts on other operations. The Hotel Communication Network plans to launch live concierge services via the tablets within the next month. No longer will guests have to go down to the lobby in search of a concierge or wait in a line to speak with someone. “We give you 24/7 live chat concierge services right to the room,” Brisco said. The Ottawa company has its sights set on eventually going global, although future growth will be done carefully, he said.